Found one file extension association related to DeepFreezer and 1 file format developed specifically for use with DeepFreezer. Don't you have many Document files or Log files? DeepFreezer makes it compact archive. There are many archiver softs which need difficult operation. In fact, operations are all easy. On the contrary DeepFreezer has excellent speed and high compression rate! DeepFreezer compress very good rate at TEXT-files. In addition to it you can lock archive by locking password! 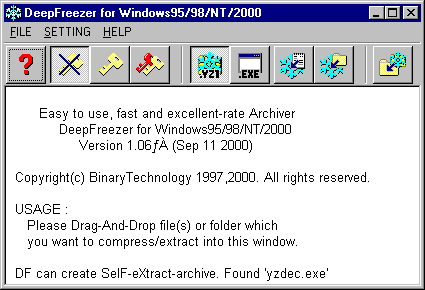 The DeepFreezer software seems to be old or discontinued. If you need more information please contact the developers of DeepFreezer (BinaryTechnology), or check out their product website.